Space enthusiasts aren’t even trying to contain their excitement about the live feed of the Starman after SpaceX’s amazing Falcon Heavy launch. You can watch the Starman video again above, even though it’s no longer live. And below are some of the best photos of Starman for your enjoyment. In case you’re wondering, Starman is a dummy wearing SpaceX’s newest spacesuit. He’s seated in the driver’s seat of Elon Musk’s shiny red Tesla Roadster. The Tesla was sent to space as a test payload for Falcon Heavy’s first launch. The third burn was successful, and the Tesla exceeded Mars orbit and kept going to the asteroid belt. It was a phenomenal day. Here are some photos shared on Reddit. Viewers sometimes spotted interesting anomalies and light refractions in the stream. 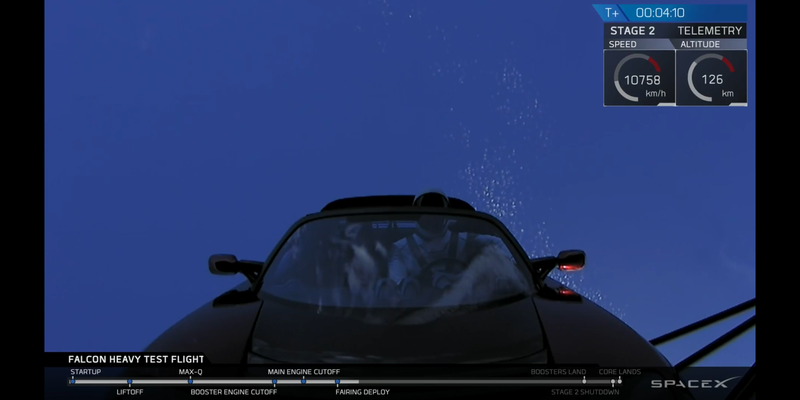 It’s hard to wrap your mind around the fact that this car is in space. I love the “Don’t Panic!” on the screen. What’s next for the Tesla? The mission will continue on an experimental long coast and third stage two burn. The long coast could last six hours through the Van Allen radiation belts. This leaves more things to chance, such as the fuel possibly freezing, oxygen vaporizing, and other issues that could hurt the rocket’s ability to reach trans-Mars injection. Problems at that stage might mean that the Roadster doesn’t escape Earth’s orbit but burns up in the atmosphere instead. Or it might just end up orbiting Earth for a while. The car will eventually travel even beyond Mars. And it’s carrying three cameras, so we might see some pretty amazing photos. See the best pictures of the Starman as it travels away from Earth.